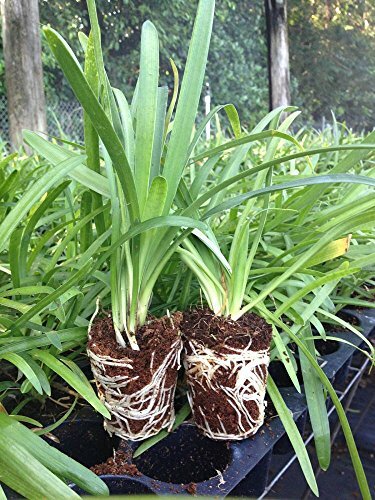 60 count trays of fully rooted 2" Agapanthus Lily of the Nile plants. Attractive, deep blue flower clusters on stalks above clumping, evergreen foliage. Good container plant in colder areas or perennial color accent in outdoor beds where winters are more mild. Fire resistant. Agapanthus makes a lovely back border or focal plant due to its height, beautiful trumpet-shaped flowers and leaf texture. For a dramatic effect, plant a large grouping throughout a sunny garden spot. Agapanthus flowers can also be used in container plantings in cooler regions. Especially striking when grown en masse, the blossoms open to magically transform a landscape. Sometimes called African Lily, this plant works in a tropical setting or formal landscape...or creating a cottage garden or English garden look.